It's very difficult to maintain comfort in a two-story house with one heating and air system. This is because hot air rises moving directly to the upstairs areas. The bigger the opening, from the downstairs to the upstairs, the more severe the problem. There are several ways to solve the problem. One is to put in two systems, one for the upstairs and one for the downstairs. The second is to put in a zoning system, and a third way is to put in wireless thermostats. Two systems will give you the advantage of a backup system in case one fails. However, if the upstairs system fails in the summer, there is really no way you can cool the upstairs bedrooms with the system downstairs. If the downstairs system fails in the winter, it's difficult to get heat from the upstairs area to the downstairs. The advantage of a zoning system is that it is less expensive than two complete systems. The maintenance is less, because you're only maintaining one system, and you have the capability of putting all of the cooling or heating upstairs or downstairs. For example, having a three-ton system upstairs, and a two-ton system downstairs, on a really hot night, you could only get three tons of cooling upstairs, whereas with the zoning system, you could get all five tons upstairs to cool the bedrooms if you needed it. This is less expensive than putting in two complete systems; however, it is still fairly expensive for existing homes. For new home construction, where the ductwork has not already been installed and enclosed, this would be the way to go, as expense is not that great for this option. The third way, which is by far the least expensive and easiest to do, is to use two wireless thermostats, putting one of the thermostats upstairs in the bedroom and the other thermostat downstairs at the normal location. Whichever thermostat you push the button on is then the controlling thermostat for the system. 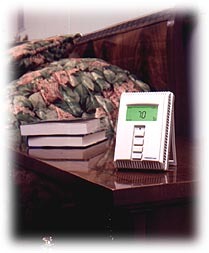 If you are in bed at night, you can change the temperature by just having the thermostat sitting on your bed stand. Then, when you go downstairs in the mornings, you can control from the thermostat that is in the downstairs location. You can even program these wireless thermostats so that at bedtime the control switches over to the upstairs thermostat, and in the morning, the control switches downstairs to the downstairs thermostat. You still have complete control from any location at any time, because if you push the buttons on any thermostats, then it will be in control. This will also give you the advantage of being able to move the upstairs thermostat to a different room if you decide to sleep in a different room, or even keep the baby's room at a perfect temperature with a new baby. Of course, downstairs, you can move the thermostat around anywhere you want. You could move it into the kitchen when you are eating, and then move it over to the family room when you are watching T.V., or even put in three thermostats, one in the bedroom, one in the kitchen, and one in the family room. You can actually have up to four thermostats controlling one heating/air conditioning system. See wireless thermostats for more information.